NEMCO’s Belgian Waffle Bakers are available with fixed or removable grids in natural aluminum or Silverstone coating. The Waffle Bakers are available single or dual also in natural aluminum or Silverstone coating. 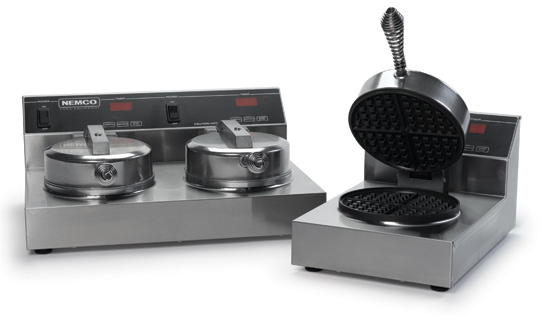 All NEMCO’s waffle bakers are designed to fit flush against the wall, take up minimal counter space and offer top mounted controls to provide easy access for changing cooking time and temperature. NEMCO’s units also come with coil spring “Cool Touch” handles, so you never need to worry about the handles getting hot. Both series of waffle bakers make a 7” diameter waffle. The Belgian waffle is 1 3/8” thick and the regular waffle is 1/2” thick. Launched in 2008 by the German Knife company of the Turbo Air Group, Radiance brings innovation to the modern kitchen. With an expanding line of over 35 models, from countertop units, to oven ranges, to microwaves, Radiance delivers higher quality units built with superior materials and more efficient designs. 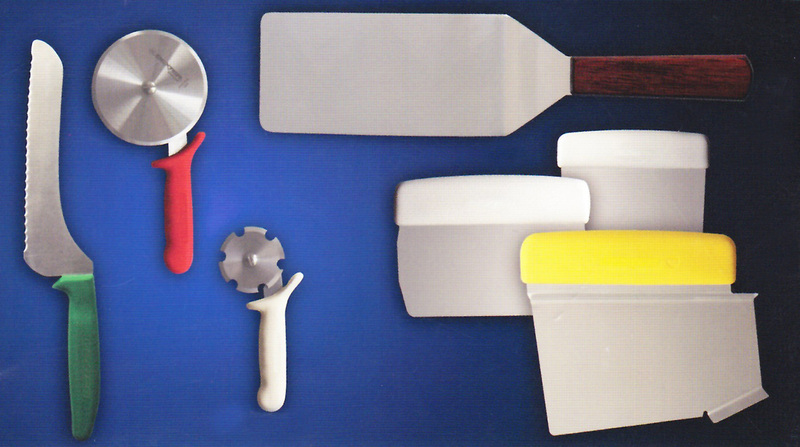 German knife’s vision to satisfy the needs of those looking for superior cooking equipment has manifested itself in the creation of units built to be the perfect cooking solution. The Radiance line continues the Turbo Air Group’s tradition of using engineering expertise to take significantly less energy from the environment and yet deliver more to the cooking professional, ultimately for a more flavorful, cost effective experience for the diner. As you look at a couple of our units featured below, you may notice the use of longer lasting materials and sturdier construction. Even the grates and knobs were designed to improve the cooking experience and eliminate distractions. Radiance’s passion is your customer’s satisfaction. 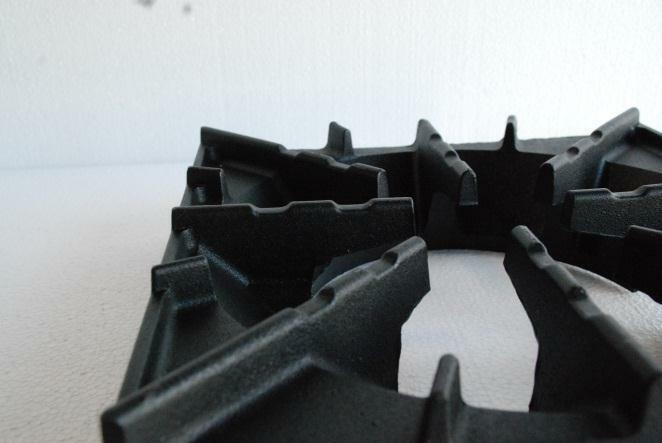 Groove top design allows flames to reach the bottom of pots to maximize contact and efficiency. Reversible 3 bar grate with grease runner is standard. 4 bar grate is available for purchase. Fagor Industrial is part of a major Cooperative business group named Mondragón Corporación Cooperativa, (MCC) with more than 330 corporative companies and 93,000 direct employees, including a financial institution and an insurance company. Due to its cooperative spirit, which is defined not only by the concept of cooperation and by a concern for the training of individual members, but also by its democratic system of responsibilities and rewards, it makes MCC the only one of its kind in the world. Fagor was established in 1960 with its main offices in Oñati Spain. Through the years, Fagor Industrial has become one of the leaders in the European market for Cooking, Laundry, Dishwashing and Refrigeration equipment. Nowadays Fagor Industrial has the benefit of eight manufacturing plants with a presence in more than 90 countries on 5 continents, including 28 subsidiaries in places such as United Kingdom, Australia and the United State. Fagor Industrial is a company that is a referent at a world level and that is devoted to the comprehensive industrial equipment for collective catering ovens, cooking, buffets, dish washing, laundry and commercial refrigeration. Our Slide Topunits are designed with durability and strength along with feature rich standards uncommon in the industry today. Refrigeration system is a free flowing air system throughout the box to ensure “ICE COLD” products at all times. 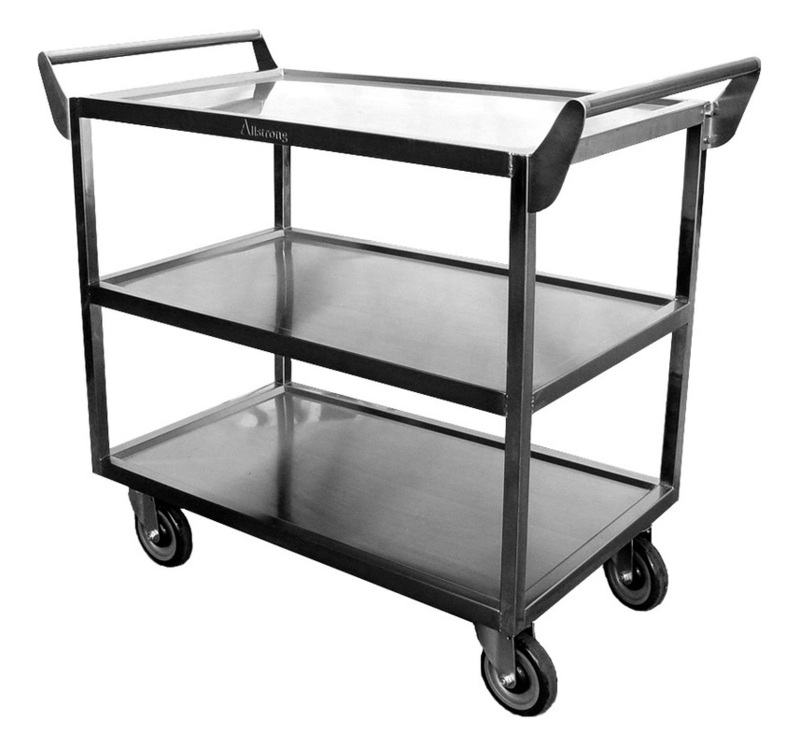 Heavy duty 18 gauge stainless steel top with anodized aluminum bottle rails. Stylish wear resistant black vinyl on steel finish front, sides and back. Standard with Incandescent interior lighting to provide full visibility to your bottle and door locks to protect your inventory. 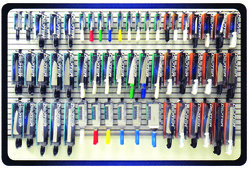 Heavy duty adjustable bin dividers, epoxy coated. Units come with compressor mounted on the right side with service friendly slide out rail system. Drain is located in the back compressor housing. (1) Cap catcher - Std. Our Direct Draw units are designed with durability and strength along with feature rich standards uncommon in the industry today. Refrigeration system is a free flowing air system throughout the box to ensure “ICE COLD” products at all times with a side mount evaporator system. Heavy duty 18 gauges stainless steel top, durable stainless steel coved corner floorand reinforced bottom door frame to protect your long term investment. Polymer “Dunnage style” removable protective floor for extended life of your box and designed for greater air flow underneath your kegs. 3” diameter polished stainless steel draft tower with more taps per tower standard than our competition. Cold air into the towers is designed thru our unique combination system which provides you with the most air flow into your towers than anyone in the industry. Field interchangeable doors from Solid to Glass or Glass to Solid to adapt to ever changing needs. Units come with compressor mounted on the left side with service friendly slide out rail system. Drain is located in the back compressor housing away from your customer’s line of sight. Incandescent interior light underneath the mullion to protect itself from normal operations. NSF approved for bottle and pre packed goods. At Alida Restaurant Supply, We are proud to offer Fagor to Our line refrigeration. Check out Our Best Deals in town on Fagor Refrigeration for limited time only. Call us or come to the store to place your order. How to keep your Thanksgiving food warm for your guest or customer? People said it's almost impossible to get every Thanksgiving dish ready at the same time. It means that some dishes end up being cold by the time you're ready to serve the meal. Before you know it, you're guest or customer is complaining about the cold dishes. Another Thanksgiving nightmare has taken place. It doesn't have to be this way though. There are simple ways to keep each dish thoroughly heated until everything is ready. 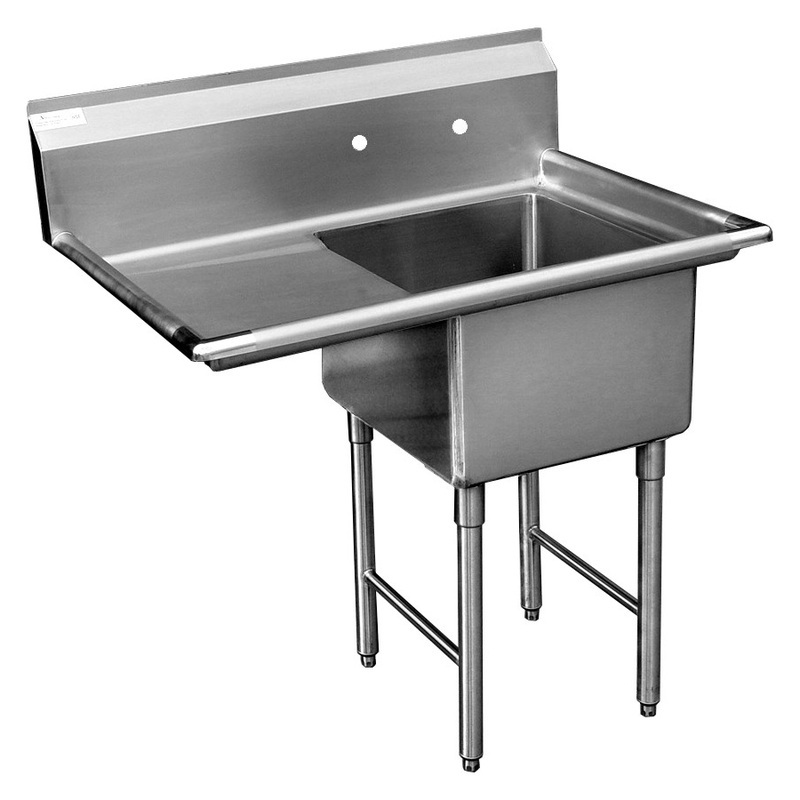 Chafing dishes are serving equipment designed to keep food warm for extended periods of time. 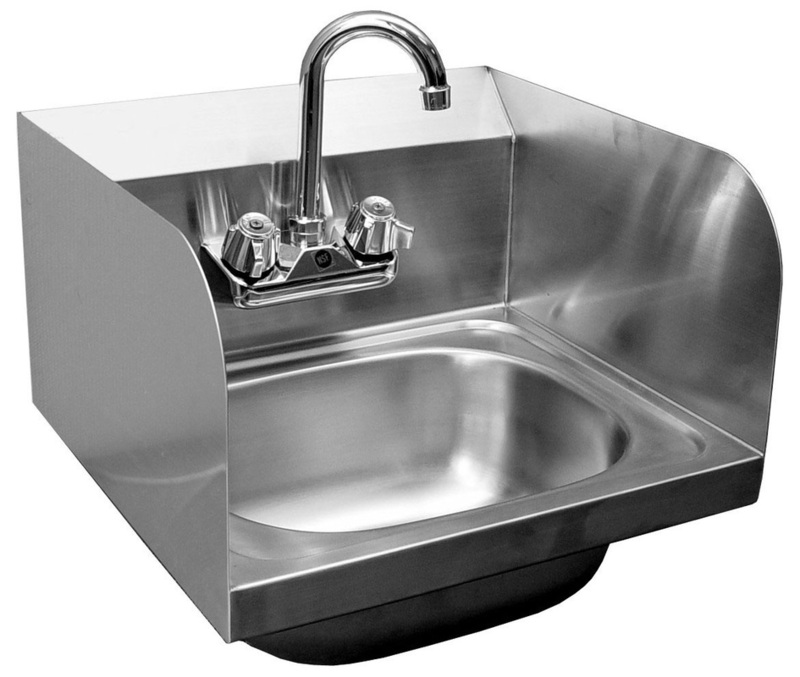 Modern chafing dishes have three parts: a water pan, a frame and a cover. They are useful for outdoor parties or large indoor buffets because they don't need electricity and safe. 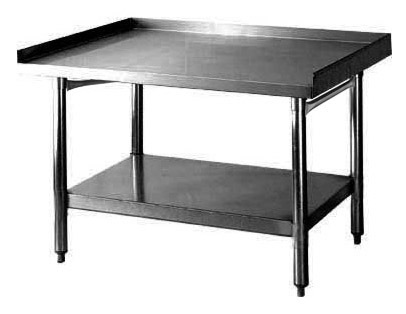 Food to be kept warm should be fully cooked and heated to serving temperature in a stainless steel or restaurant-quality disposable aluminum pan before placing it on the chafing dish. Chafing dishes are tools used to keep food warm after it has been cooked. Place them on a buffet table so your guests can serve themselves hot food even when they come back for seconds or thirds. It is important to arrange a buffet table in a manner that is easy for guests to access and easy to reach and in a logical order. Get your chafers today, we have the best deal in town for limited time only. Call us or come to the store to place your order. (up to 50% of purchase price, limit apply) on Energy Star® Natural Gas Fryer. * Please visit www.swgasliving.com for more details. Alida Restaurant Supply, a family-owned business has built the reputation as an industry leader in the distribution of restaurant equipment, commercial hospitality furniture, and chinaware. They have been serving Arizona restaurants for over 20 years. With over 5,000 items in stock in their 38,000 square foot showroom and warehouse, Alida is proud to carry the most popular brands in food service equipment. They offer various lines in microwaves, ice machines, and kitchen equipment. Alida is known for creating and providing products with the highest quality and durability. That is why Alida carries ENERGY STAR® fryers from Pitco. In 1918. Pitco's goal was to offer a simple, reliable piece of kitchen machinery for professional frying. For over 80 years, Pitco has designed equipment that makes it easier for our customers to offer the best in fried foods. Pitco has been an industry leader in design, research, and delivering new ideas for frying. 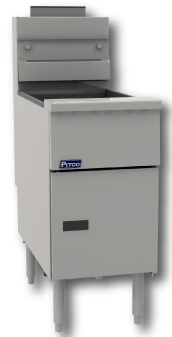 With their popular VF35 model, Pitco has established The First Ever ENERGY STAR® Qualified, Value Priced Fryer in the commercial industry for qualifying rebate programs*. Alida Restaurant Supply is proud to offer this Energy Star® line from Pitco. Contact one of Alida Restaurant Supply's experienced sales representatives today to make your restaurant vision a reality. This time, Brenden Darby and Luuk Hoffman prepare a delicious dish using local ingredients with Sammic equipment: lightly sautéed calamari with guindilla peppers, lemon emulsion, sous-vide cooked local vegetables and a reduction of leaks and tomatoes. The following Sammic equipment has been used to prepare this tasty and colorful dish: a PV-400 Vitro-grill, a citrus juice extractor ECP, a cutter (combi) CK-301, a sous-vide cooker SVC-28, a vacuum packing machine SV-420S and an electric fryer FE-3. Sammic power mixer is now available for purchase and check out Sammic equipment deals at Alida Restaurant Supply, Call our sales person now. 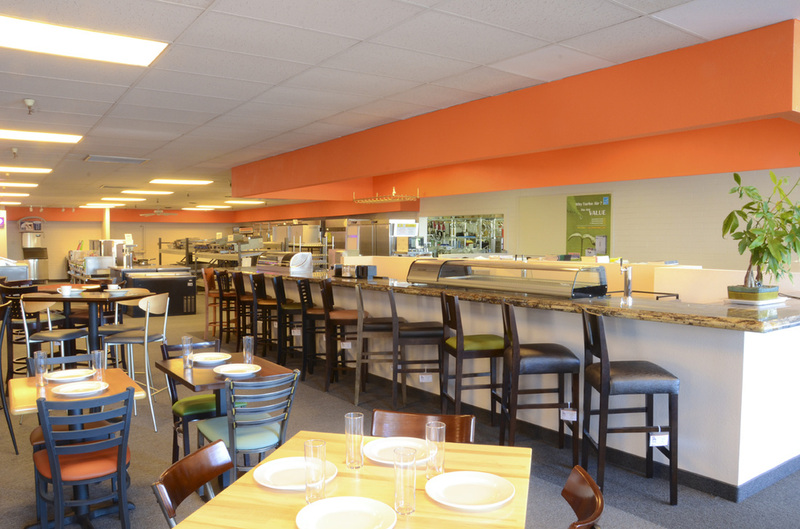 Alida Restaurant Supply, a family-owned business has built the reputation as an industry leader in the distribution of restaurant equipment, commercial hospitality furniture, and chinaware. They have been serving Arizona restaurants for over 20 years. With over 5,000 items in stock in their 38,000 square foot showroom and warehouse, Alida is proud to carry the most popular brands in food service equipment. They offer various lines in microwaves, ice machines, and kitchen equipment. Alida is known for creating and providing products with the highest quality and durability. That is why Alida carries stainless steel equipment comes from GSW. 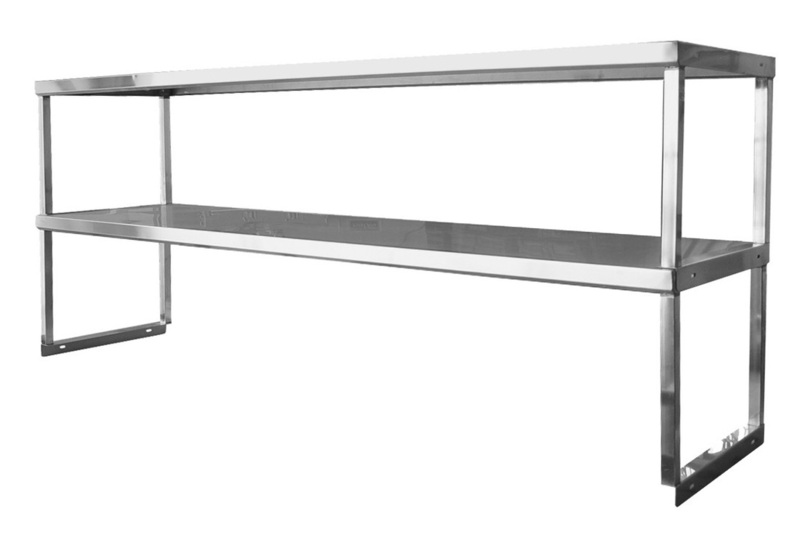 GSW is a specialist in stainless steel kitchen equipment and much more. 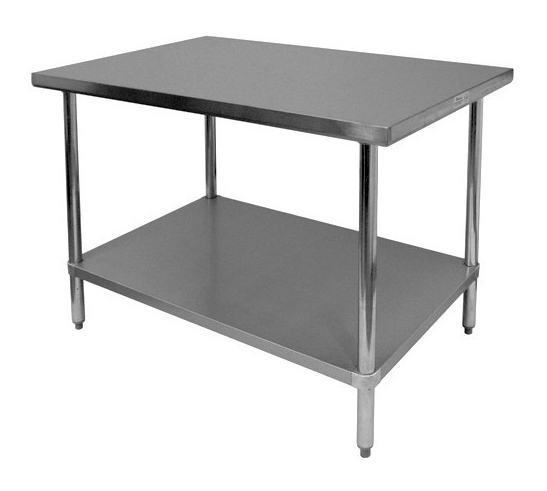 Alida Restaurant Supply is proud to offer this exceptional lineof restaurant equipment. Alida ensures the highest quality in their products and takes great pride in offering her customers variety, durability, and exceptional craftsmanship. Alida's strict quality control management team guarantees to offer you the best products in the industry. Contact one of Alida Restaurant Supply's experienced sales representatives today to make your restaurant vision a reality. Dexter-Russell, Inc. is the largest manufacturer of professional cutlery in the world. We are the proud successor to the oldest American cutlery manufacturers: The Harrington Cutlery Company and the John Russell Cutlery Company. Throughout our long and rich history, we have maintained a tradition of excellence in both materials and workmanship. Today, we continue to provide our customers with The Dexter Edge: Professional Cutlery designed, built, and tested to be people friendly and kitchen tough. We have listened to our customers and have determined to excel at what is the most important to them, Knife Sharp right out of the box, and edges that are long-lasting and easily restored. Our spatulas, servers, and turners are precision-ground for just-right flexibility. The complete array of Dexter professional cutlery, tools, and accessories provides consistent, time-tested performance in the kitchen. Well into the future Dexter-Russell will continue to be a leader in the foodservice industry through continuous improvement, investment in the latest technologies, innovative marketing, and a reliance on nearly 2 centuries of experience. Add it all up and you’ll get The Dexter Edge, the right knife and solution … since 1818. Now available at Alida Restaurant Supply. Custom designs uniquely engineered to meet the specialized needs and application of an ever demanding and fast paced food industry. For your Product solution contact us at 602-863-0688.
booths are best in value, quality, functionality and innovation! When working with Alida, our design team first discusses your product ideas, measures, and then assists you in choosing colors, textures and patterns. The measurements are sent to their factory in El Monte, CA where they build the booths to your specifications. Once the booths are constructed they are shipped to Arizona by their own delivery service. In Arizona, they are upholstered in the warehouse. The finished product is then delivered to you by Alida’s own fleet of delivery trucks and installed for you. Their turn around is quick, averaging about a week for their products.Their fast nationwide shipping is impressive. elegant wood, and the pads can be upholstered to match your restaurant design or theme. With Alida you do not have to settle for what’s available, they meet your individual needs with the highest quality of craftsmanship and service. Their huge inventory, great selection of styles, and fast shipping continue to set them apart from their competitors. Right now, during the month of June, Alida Seating Company is offering some great deals on the custom chairs featured on the picture to the right. Just come by the Alida showroom, mention the June Special, and Alida Restaurant Supply will help you customize your chairs right away! Visit their showroom and see the exceptional quality of their products for yourself. The showroom can be found at 3535 W.Thunderbird Road, Phoenix, Arizona, 85053. Alida Restaurant Supply has been serving Arizona restaurants for over 20 years. This family-owned business has built the reputation as an industry leader in the distribution of restaurant equipment, commercial hospitality furniture, and chinaware. With over 5,000 items in-stock in their 38,000 square foot showroom and warehouse, Alida is proud to carry the most popular brands in food service equipment. They offer various lines in microwaves, ice machines, and kitchen equipment. Alida is known for creating and providing products with the highest quality and durability. Although Alida boasts a large inventory of innovative commercial furniture from wood chairs, bar stools, patio furniture and custom booths, they are very proud to announce their line of Vertex Dinnerware. Vertex white ware, the company also provides top producing patterns found in their Euro Vertex, London, and Rubicon collections. Both the Rubicon and London patterns are produced on high tech bodies that offer a five year chip guarantee on all their flat pieces. The Rubicon in particular is known for having the purest white body in the industry and makes for a dramatic plate presentation. Whether you are a casual shopper or looking for something more sophisticated. Vertex has you covered. 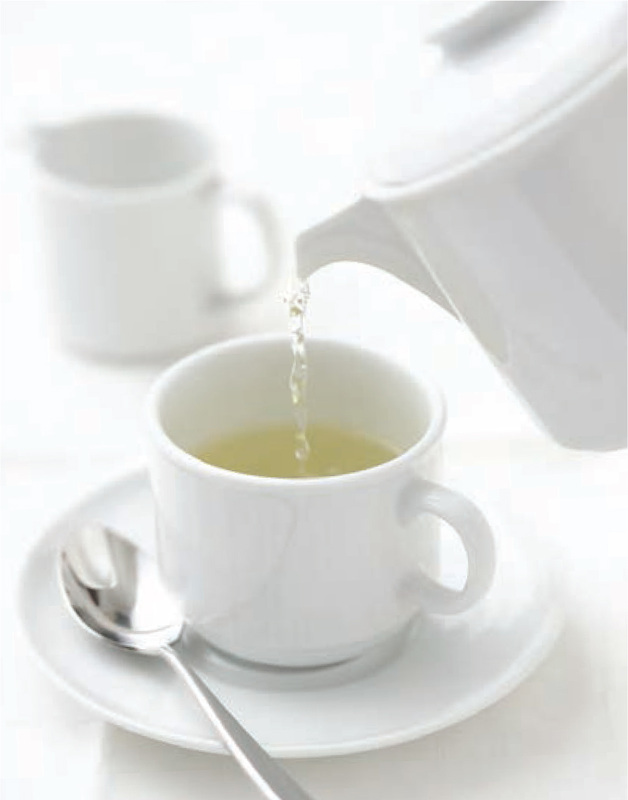 Alida Restaurant Supply is also pleased to offer Vertex's high end line of Izabel Lam Chinaware. Described as “Elegant and Pure Simplicity,” The Izabel Lam Collection invites restauranteurs to discover the endless possibilities and myriad of combinations of heights, colors, and shapes to fashion a varying oasis of enticement in food presentation. This collection can be used alone to pass scrumptious hors-d'oeuvres or grouped to create stunning centerpieces. Alida Restaurant Supply is proud to offer this exceptional line of dinnerware. Alida ensures the highest quality in their products and takes great pride in offering her customers variety, durability, and exceptional craftsmanship. Alida's strict quality control management team guarantees to offer you the best products in the industry. Contact one of Alida Restaurant Supply's experienced sales representatives today to make your restaurant vision a reality.